So today, you’re going to start keeping a journal, either handwritten in a notebook or on your computer. What should be in it? Michael says to start with your goals. Start by writing down your daily task lists for the day, highlighting the priorities. Each task should put you closer to one of your weekly, monthly, and/or yearly goals. At the end of the day, note which you accomplished and how long it took. It’ll help you figure out how much time to dedicate to future goal tasks. Anything you didn’t get to, think of what stopped you and how to overcome that obstacle. Add it to the next day. Record all your great writing ideas in your journal … for new advertising copy, new headlines, outlines for upcoming projects. Jot down interesting facts, quotes, and even links to articles that you might use in your writing projects. Capture ideas for advancing your free¬lance career, like ideas for approaching clients, ways to improve your skills, and more. “Eighty percent of the good ideas we come up with are lost because we simply forget them. Entering them into a journal and then editing them once a month assures that most of them are remembered and profited from. “I use my journal to get my day started. As a writer, I face the same blank page/screen every writer faces each morning. Rather than wait for the proverbial flash of inspiration, I begin by opening up yesterday’s journal en¬try, reading it, and using it as a springboard for the writing I will do that day. May 26, 2015 173 So You Want to Write a Book … Then What? The Barefoot Writer opens the door to the world of paid writing opportunities. 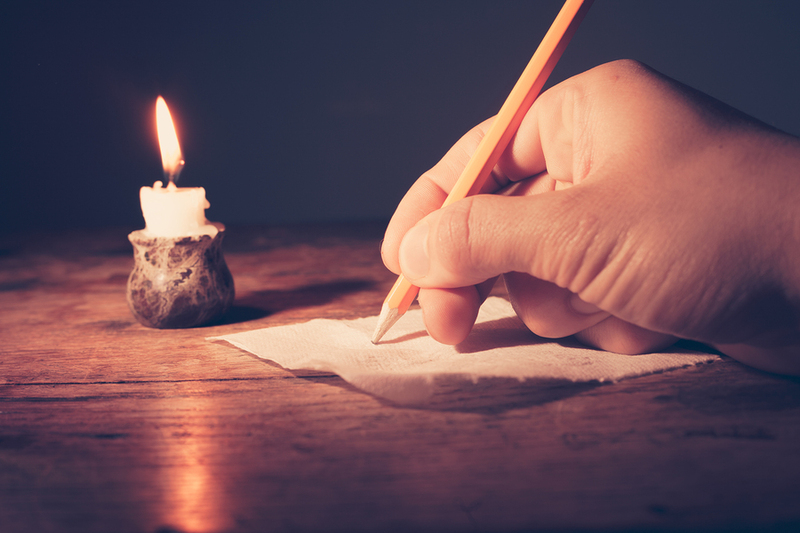 You’ll read about ways to dramatically improve your lifestyle as a writer — for the better. Fascinating projects … luxurious lifestyle … inexpensive ways to get up and running, fast. Rewarding writing exercises. A community of supportive, like-minded writers. Ways to let your imagination and creativity soar. ©2016 American Writers & Artists Inc.
You CAN make a living as a writer… You just need to know what the best-paying opportunities are. Get the Inside Scoop - Download Our Free Report Today! a VERY Good Living as a Writer! 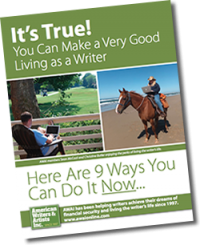 PLUS receive our FREE Newsletter The Writer's Life packed with expert advice on how to make a great living as a writer. Get paid to write and build the freedom-filled life you’ve always wanted.